the db 801 dirtbike - childrens playtime! A mini mad dirtbike - for kids. The db 801 dirtbike, is a great little pocket bike for riders interested in these smaller machines. They have a small but durable two stroke, 49cc engine, ideal for kids and children wanting a taste of motocross thrills. On the Go with the Db 801 Dirt Bike. Designed to give the impression of performance, the Db 801 dirtbike is a stylish machine with exemplary features. It is classy, has an electric or manual start and is available in a variety of popular colors. The 2 stroke, air-cooled 49cc engine accounts for a lot of power. It is not for a beginner. It is designed perfectly for the smaller rider who has a grasp on what riding is all about, observes safety requirements and can handle the responsibility of being in charge of his or her own ride. 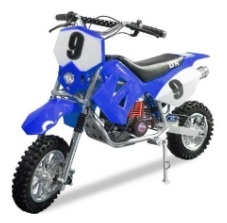 The Db 801 dirtbike is a great way to reward your child for learning how to handle a motorized bike and be responsible. Having conquered the challenge of keeping a bike upright and giving just enough throttle to keep the bike going at the desired speed demonstrates skill. Showing respect for others while riding the trails without showing off in a dangerous fashion shows common sense. So many holidays and events are gift occasions, so why not use one as a reason to reward the future MX star with a dirtbike. Some of the problems with the Db 801 dirtbike or any bike of this caliber is the accessibility to parts for replacement. Price and performance make these bikes a real bargain, but with the majority of them built in Mainland China and Korea, there is always the possibility of a freeze in exports and imports, making the parts hard to find. Pocketbikeparts is one site that stocks the parts and many of the MX blogs say that parts from other bikes are usually interchangeable. There is the option of finding local machinists who can design the part, as well as locating parts on eBay and various dirtbike parts sites. Another 49cc option is the NOS 2003 Tomos MC50 Junior Moped Dirt bike - a 2-speed automatic which is listed on eBay with a starting bid of $499.99 or an advert by a private seller for a 2005 Tomos listed as "new, in the crate" for $500. A new Db 801 dirtbike starts out around the same price, with assembly, shipping and in some cases, taxes, added at the end. The best thing to do is shop around. Also on an eBay listing is a Baja 49cc dirt bike (DR50) with a starting bid of $249.99. The bike needs work, but on the other hand, a portion of ownership is learning care of the mini motocross bike and this can be a good experience for your child while you teach how to change tires and replace plastic and chains. Like most 49cc dirt bikes, the DR50 is air-cooled, has hydraulic disc brakes and an emergency switch. The Db 801 dirtbike reflects the pattern countries all over the world are taking by letting kids learn at a young age the things that enhance their ability to survive in today's world. Taking care of a MX bike prepares them for pets and the social skills needed as part of a family. Learning things - worth teaching to others is a great opportunity to succeed in life. Mobility is so much easier when safe practices in riding, including putting on gear, are a matter of habit. Honda, Kawasaki and Yamaha have prepared a path for newer companies such as Yongkang Hardware Develop Co and Zhejiang Mingyang Motors to follow. 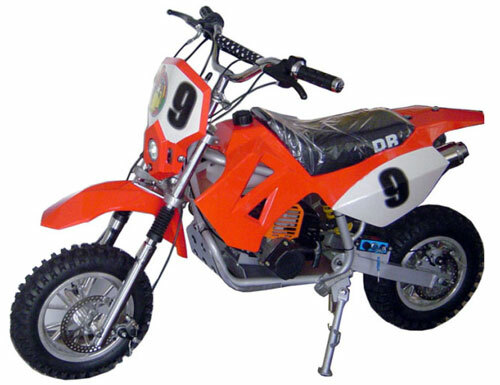 The Db 801 is a superb mini motocross bike for children of all ages and great to cut your teeth on. Even adults may want a go as they are so much fun. Be aware even a 49cc power unit, can pack quite a punch as the bike is fairly light, so its best to make sure your child has the skill and ability to control this bike. Many examples are available from stockists and even private sellers, so go ahead and bag yourself a really neat buy. On the website http://familyoffrd.com/index_files/Page1687.htm we found a great kids bike. Called an N-DB-801 (To give it its full title) - its a small 49cc single cylinder engined non-branded ride. The 2 stroke air-cooled motor should give your child plenty of speed. Certainly the max speed on this model is advertised as 35km/h ! It has an electric & manual start, with a weight loading of 90 kgs. All in all for $499, this small db 801 dirtbike is ideal for most competent kids, and the price gives excellent value. This is one of those rides your child can say this is "my dirt bike", and mean it - and there are many dirt bike sites offering good kids bikes - other than this one of course. The db 801 dirtbike is a bit of a rarity, so do ensure you have some spares bought “just in case”. When your MX kid progresses onto more powerful bikes a few weeks at a dirt bike school is a must. This will give them the confidence and ability to stop injury and stay safe on their big brother motocross bike. Plus all that experience on their simple Db 801 will be invaluable too. You can select all types of dirtbikes for having fun on a lazy afternoon. And the 49cc mini dirt bike is the most popular buy for most first-timers. From the Tomos MC50 Junior Moped, to the Db 801 you’ll see that although they are sold as “quality bikes” they are just for puttering around on some off road ground and NOT for big excessive jumps and stunts. 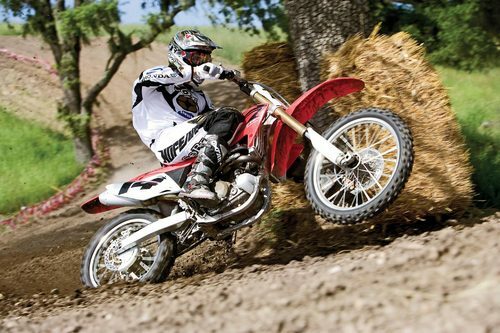 You’ll be needing much more rugged bikes like the mini Honda’s and Yamaha’s for that activity.